A real cicada wing was traced to reveal every vein line. 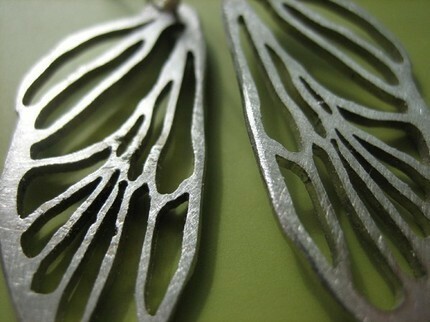 The design was then laser cut onto thick stainless steel, making the spindly lines become the framework to a pair of beautiful silvery wings. The steel has a brushed texture is smoothed along the sides. 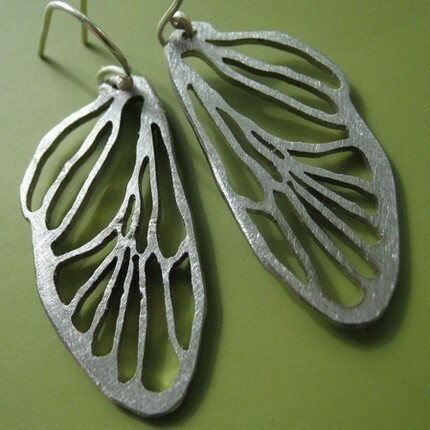 I have two versions of this earring. 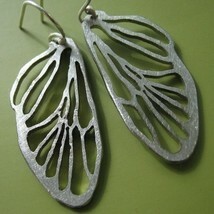 This one is modeled after the lower, smaller set of wings that are found on the cicada. The wings are a mirror image of each other. The wing portion measures 1.25" long. 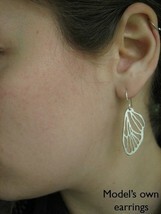 With earwires they measure about 1.6" (4.25cm) They come packaged in a little gift box, perfect for giving.